When looking for the most economical option for your stay in China, youth hostels like in the rest of Asia are hard to beat. Prices can be as low as US$8 per night for bed in a dorm style accommodation with common areas for showers and bathrooms. 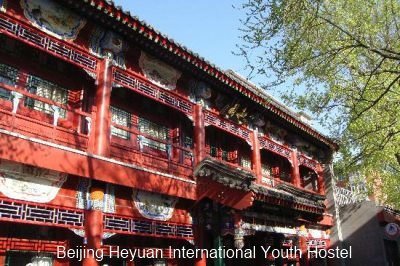 International Youth Hostels are plentiful in all larger cities in China. Besides providing cheap accomoddations, youth hostels in China are usually located in very centric and convenient areas in the middle of the city, close to metro or train stations. You are likely to meet fellow travelers to exchange stories and travel tips and find that these are your best sources of information for your travels in China and the region. Staff at International Youth hostels is more likely to speak better English than the inn-keeper at a small local guesthouse. Hostels are used to dealing with the foreign traveler and can be very helpful in making travel arrangements. When it comes to hostel facilities, there is a wide range of standards in Youth Hostels in China. Some hostels might offer the basic "dorm" accommodation where you will share a large room with other fellow travelers. In some cases, private bedrooms and baths are also available at these places. Others are more like mini-motels or guesthouses and will offer private rooms which will be substantially cheaper than a regular hotel room. What each offers in terms of ammenities also varies greatly and you have to make sure you know what is included in the price. Things like bed sheets, towels, internet access, breakfast and even toilet paper might be included in the price at some hostels but not in others. Hostels tend to fill up quickly, specially the popular ones, so the sooner you make your reservations the better chances of getting the hostel of your preference. It is easy nowadays to choose and book a Youth Hostel in China online. To get started, we have had good results with Booking.com which nowadays carries an enormous selection of hostels and guesthouses in all cities and regions in China. Properties are rated by visitors that have stayed recently and helps you to narrow down the search. Checking visitors' reviews and recommendations is probably the best way to get a feel for what a particular hostel offers. You might find these rating systems quite useful by looking at the individual categories that are important to you. If a hostel has poor marks for "cleanliness" for example, that would be a deal breaker for us even if it was in the perfect location and the price was right. Once you have made your decision and chosen the perfect hostel for your stay in China, it is quite easy to make a booking and get a confirmation right away. The payment options are also very convenient and is one of the reasons we like reserving through Booking.com. The FREE cancellation feature is quite useful so you can reserve and later cancel without any penalty if within the requerid time, normally 24 - 48 hours prior to your arrival. In most cases no prepayment is necessary and you pay at the property when you get there.